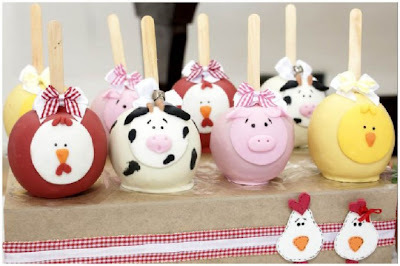 This fun barnyard party from Bebe-A-Porter was featured over at Pizzazzerie and my favorite party treat were these cute barnyard animals. They look like caramel apples to me, but Courtney says they are cake pops. Either way, they are CUTE! And I have to say using fondant to decorate them is a brilliant idea and a thousand times easier than any other idea I have tried. You can see the rest of this fun barnyard party HERE. why can't I be so talented?! Ah, they might be caramel apples. Whoopsies! Love your blog. Thanks for sharing!